The events of the week offered two extremes. The last fruits of a culture that would listen the church, and the declaration of the end of that listening. This is a little raw, but call it first pass a law and gospel in exile. The fact of repentance and the hope of return. 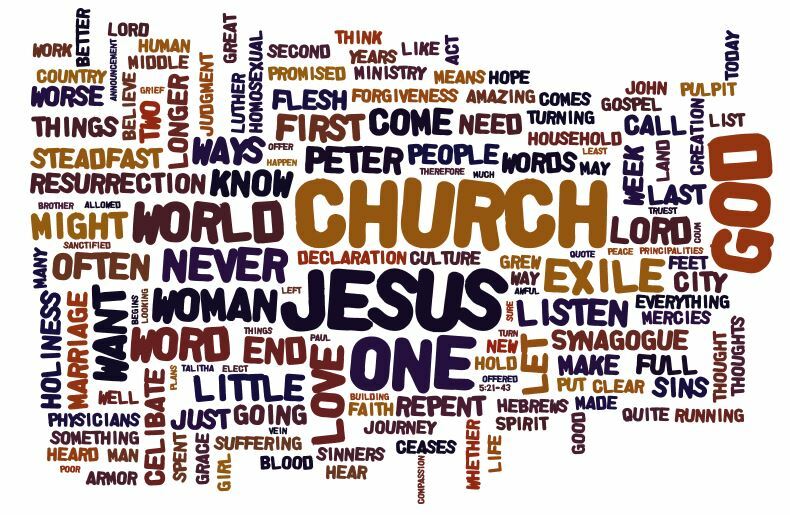 Evangelism: Sadducee and Pharisee and ears to hear? The old testament readings in the daily reading series just started to take us through the book of Daniel. Since it is now after Easter, I hope to get back on track with these posts and a new book seems like a good place to start. Daniel is also one of the names if it is a boy we might use for our expected baby. Daniel as a book is also one of the most critically challenged books, at the same time having some of the highest homage paid to it by Jesus himself. Jesus quotes from it in Matt 24:15. Jesus also takes the name he calls himself – The Son of Man – from Daniel 7:13-14. All those seem to be good reasons to take a devotional look at Daniel. Daniel is a book of opposites. It has the sunday school staples of the firey-furnace, the lion’s den and the infamous source of the phrase “the writing on the wall”. Daniel also has apocalypic visions that are opaque and not used in Sunday School. The book itself is composed in two languages – Hebrew and Aramaic. The stidently Jewish Daniel is the star of the Babylonian court. The typical jewish attitude toward gentile rulers is absent and instead these Easter Emperors are the servants of God. Those gulfs in the book stradle to today. Critical scholars want to date the book to the 2nd century BC. Traditional dating is the 6th century BC. That 400 year gap is larger than even the gap between a traditional dating of the exodus and the alternative timeline. A book of opposites. The opening is of four children of Jewish nobility being instructed out of their tradition while in exile. They get new names. They learn new languages and alphabets, and they are expected to eat the finest the court has to offer (probably pork.) But instead of swallowing it all, the four are graced by God. They adapt to the profitable and reject the dangerous. They maintain their idenity in the face of what surely looks like the better and wiser path. And they maintain that identity while not rejecting or scorning the good of the gentile kingdom. This is something God has ordained. They will not worship the kingdom, or follow its ways, but they will support it with the best they have been blessed with. In Jeremiah’s words they pray for the wellbeing of the place they have be exiled to. Is that not the same situation of many Christian children today? After being brought up in the faith, they are exiled away from parents and supporting people to a university – a place surrounded by all the wonderful good things that this kingdom has to offer. New knowledge, new languages, new foods and the opportunity to put on a new identity. I’m at a loss to pull a solution from the passage as it just says that Daniel resolved not to assimilate. Daniel asked those is charge to eat the Jewish diet. And God graced Daniel with understanding teachers and gave him learning and skill and wisdom. Maybe the idea is prayer and preparation. Preparation in that it is a parents job to teach a child and form in them a sense of identity. Prayer in that once that formation is finished, you pray for God’s grace to sustain them. No magic bullet. Just years of work followed by years of prayer. Do we find ourselves in exile in a strange land? Has everythign that we have known seemingly been pulled out from under us? God’s answer is not opposition or withdrawl or nostalgia. God says stay engaged and pray. He has plans for his people. God always has plans for His people. That promise given was to those exiles specifically, but it does take on broader views. “I will gather you from all the nations and places where I have driven you.” Those Israelites were in Babylon. The church is spread throughout all nations. God has a plan for His people.